Simultaneous interpretation was once said to be a “superhuman skill,” but simultaneous interpretation is not a superhuman skill. It is of course a special skill, but as long as you understand the cultural backgrounds of Japanese and a particular foreign language and can communicate using both languages, anyone has the potential to acquire this skill. As in the saying “what one likes, one will do best,” if you make the effort, you can be sure to improve. The best route to becoming a communication specialist is to keep on training without stopping to wonder whether you are competent enough. We encourage you to take the Saturday School “Training Course” and try your hand at interpretation. 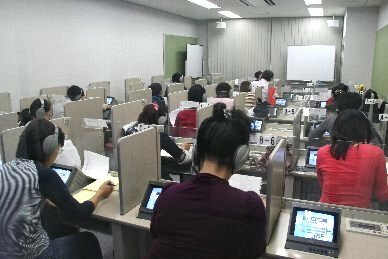 This course is for those who wish to enhance their English and Japanese communication skills, learn how to study to become an interpreter, and try out simultaneous interpretation in a lab. Leading interpreters will use Professor Mitsuko Saito’s theory as a basis to instruct you in comprehensive cross-cultural communication that goes beyond linguistic abilities. This is a course for advanced students who have already completed the training course, in-house interpreters, and freelance interpreters to further polish their skills. Leading professionals provide hands-on instruction, teaching students how to interpret in various fields using both the classroom and labs. As with the training course, this course offers great variety and a friendly atmosphere. The “simultaneous broadcast interpreting workshop” that we started offering in May 2002 has spawned a large number of professional simultaneous broadcast interpreters who are now working in a wide variety of fields. 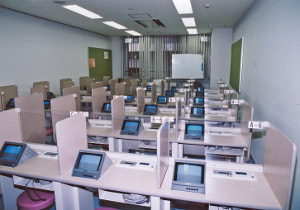 In lectures that simulate actual interpreting environments, a lab in which each booth is equipped with a TV monitor is used to train simultaneous broadcast interpreters in the required skills, centered on simultaneous interpreting and prepared interpreting training. We also concentrate on training interpreters proficient in economic issues, who are high in demand. 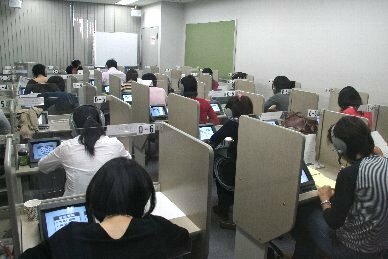 This lecture, in which the number of applicants sometimes exceeds the course limit (30 students), is held on Saturday afternoons from 1:30 to 4:00, with ten classes per term, and is offered in May, October, and January each year. *From English into Japanese only. 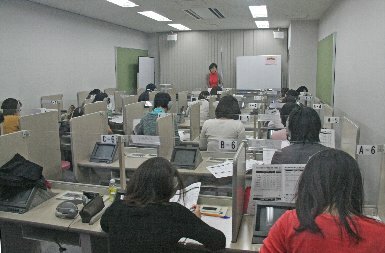 This is an intensive two-day course offered during the summer. 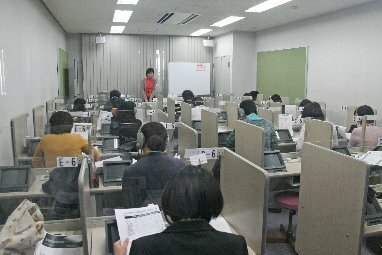 Leading interpreters train students mainly in simultaneous interpretation using the labs. The course aims to enhance comprehension skills and communication skills in both Japanese and English through intensive training based on communication theory. The expression “playing catch with words” has become increasingly common nowadays, signifying that listening to someone’s words wholeheartedly, understanding the message, and giving a sincere response in return is crucial for effective communication. In fact, this is the title of the book published in 1981 by the late Professor Mitsuko Saito, pioneer of cross-cultural communication and simultaneous interpretation. Professor Saito had the habit of saying “do what you can’t do” and “practice makes perfect.” Rather than compete with others, we should work hard to improve ourselves. We look forward to meeting you at our Saturday School, taught by professional interpreters who have inherited the principles and passions of Professor Mitsuko Saito.